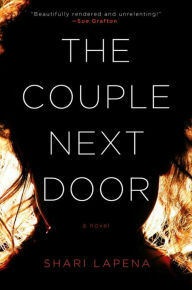 The Couple Next Door by Shari Lapena is a thriller easily read in one to two sittings. Parents to 6 month-old baby Cora, Anne and Marco Conti go to their neighbor’s house for dinner on an evening that ends in disaster. The houses are attached and although they bring the baby monitor and check on her every half hour, Cora ends up missing and supposedly kidnapped. As the mystery unfolds, the parents are the first suspects and secrets in their pasts are uncovered. Similar in plot to Joy Williams’ recent She’s Gone, The Couple Next Door unravels quickly with anticipation as the reader is left wondering if the child will be found dead or alive. Plot twists and last-minute surprises promised. This entry was posted on September 1, 2016 at 6:00 pm and is filed under Adult Readers Advisory. You can follow any responses to this entry through the RSS 2.0 feed. You can leave a response, or trackback from your own site.